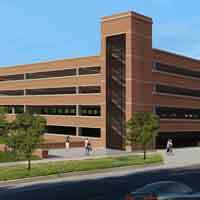 ST. LOUIS - Construction on the expansion of the Webster Groves Parking Garage is underway. When completed in spring of 2017, it will add more than 550 new parking spaces to the home campus and alleviate the long-standing parking challenges on the home campus. While waiting for the new garage, several initiatives are being launched that will add more parking to the campus and offer other alternatives during the 2016-2017 academic year. These include leasing nearby lots, shifting on-campus cars to underutilized University lots, identifying locations where more parking could be temporarily added, and using the metro system, carpools and bicycles. When construction is complete, the Webster Groves campus of the University will have 2,184 parking spaces. Before construction started, the campus had 1,622 spaces. The University has leased the parking lot at the now-empty Webster Groves YMCA property, located two blocks west of the campus at Sylvester and Lockwood avenues, and other lots off campus for select groups of staff/vendors to park. Supervisors will inform employees if they are designated to park in those lots. This will open up parking opportunities for students on campus. University officials have identified a number of reserved and special-use parking spaces in existing University lots that frequently are unused. Those spaces will be converted into regular parking spaces this year. Public Safety identified Lot M, located next to the residential halls, as a parking area that frequently had open spaces throughout the year. Students who live on campus and have a green “garage only” permit will now be allowed to park in Lot M, thus shifting cars out of the garage for commuter students. University officials are in talks with other commercial and business entities to request spots for staff and student parking for the academic year. The Metro Pass program has been renewed. All students, faculty and staff can get a free annual pass for the St. Louis Metro system at the University Business Office in Webster Hall. Currently, city bus stops are located near the front of Webster Hall and in front of Sverdrup Hall. Those buses make stops at several Metro rail stations, making it easier to travel throughout the region. For more information, visit http://www.webster.edu/campus-life/metroupass.html. New bicycle racks have been installed on campus in the past year to encourage more bicycle riding to campus. The University’s Sustainability Coalition also has a bicycle repair station on the University Center patio. See http://news.webster.edu/webster-life/2016/sustainability-bike-fix-station.html for more information. The Enterprise car-rental program has been continued. Students, faculty and staff can rent an Enterprise car for an hourly rate. Faculty and staff who wish to use the car for official business should visit http://www.webster.edu/finance-and-administration/procurement-services/travel.html. Students, faculty and staff who wish to sign up for the program should visit https://www.enterprisecarshare.com/us/en/programs/university/webster.html for more information. Carpooling will be encouraged throughout the year with incentives for carpool drivers to win prizes such as Kaldi’s Coffee or The Cyber Café certificates. Watch Webster Today for more information. Anyone with a parking permit who decides by Sept. 2 to use other means to get to campus can get a full refund for their parking permit from Public Safety. Students who live on campus will be encouraged to keep their cars at home. Doing so will save them the cost of a parking pass, lower insurance costs and save on gasoline and car maintenance. As the academic year progresses, we will continue to monitor the parking situation and consider other solutions.